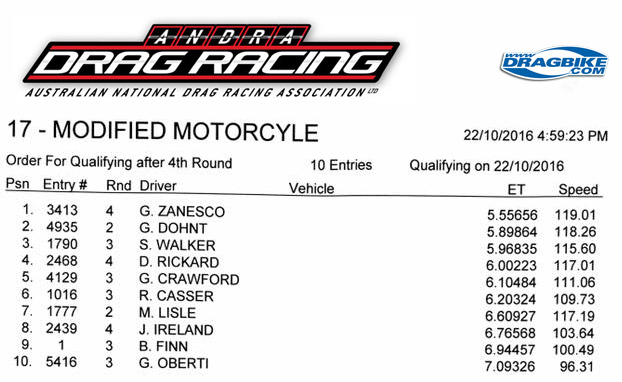 The Moving Man Gordon Crawford (Mundaring, WA) picked up his second ever ANDRA Christmas Tree in Modified Bike taking out Greg Oberti, Johnny Ireland and Rob Cassar to meet defending Champion Bryan Finn in the final. Finn had the advantage with the handicapped start and Crawford needed to react fast to chase him down. 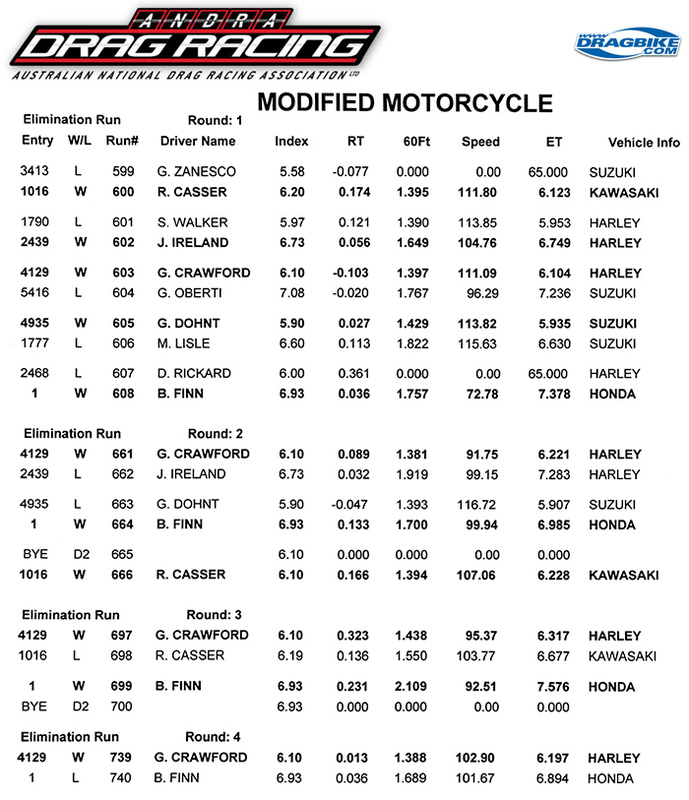 A .013 second reaction time from the West Aussie set up the pursuit with Crawford reeling the Champ in who broke out trying to hang on with a 6.894 at 101.67 mph on a 6.93 dial in. Crawford’s superior 6.197 at 102.90 mph on a 6.10 dial in won the day. ANDRA thanks the Sunraysia Drag Racing Association staff, volunteers and sponsors including Mildura Gateway Tavern for an outstanding race track and a great event. The next round of the Summit Racing Equipment Sportsman Series takes place at the Rowe Memorial Super Stock Classic on November 19 at Calder Park Raceway. 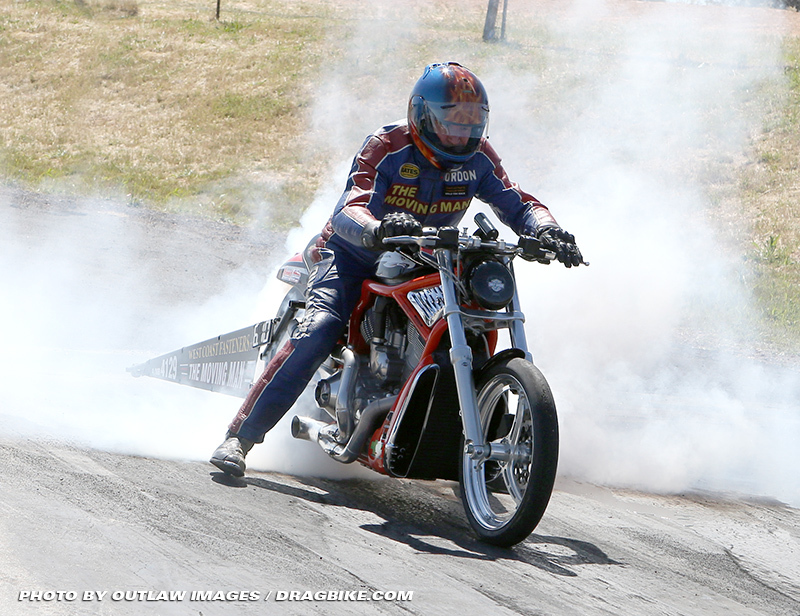 For more information please visit www.calderparkdragracing.com.au.